Coconut Grove will always be a very attractive place to live, both for locals and foreigners. The real estate in Coconut Grove is constantly revalued and has increasingly become a highly sought after, interesting place to live. 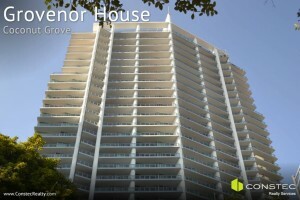 Usually there is shortage of inventory in all areas of Coconut Grove, both in houses and apartments. This helps maintain and enhance home values. However, the prices of real estate in Coconut Grove are still lower than those of Key Biscayne and Miami Beach. This causes the properties sell quickly in Coconut Grove. The best private schools in Miami can be found in Coconut Grove, a very important factor for many foreigners used to this type of education. Furthermore, this small exclusive site is located on the shores of Biscayne Bay and is surrounded by small restaurants, and quaint shops and galleries. It truly is a community where people walk and is also one of the most famous sailing competition destinations in the world. 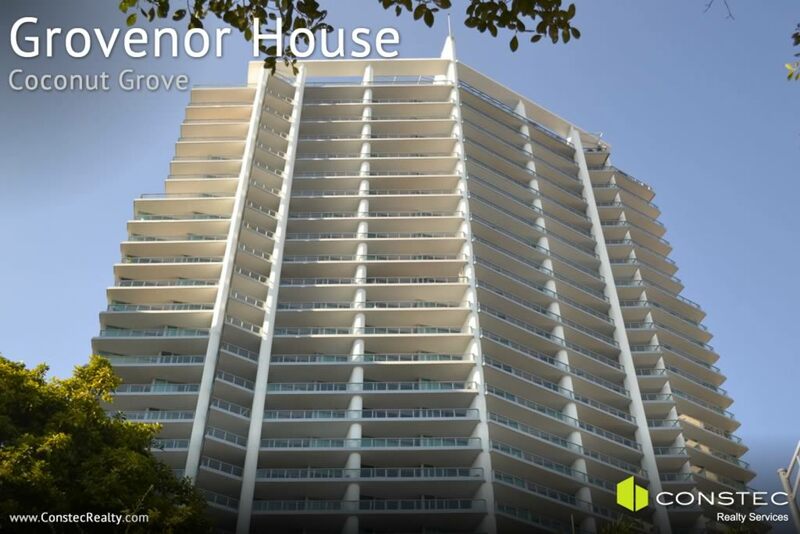 There are two pre-construction projects in Coconut Grove; Park Grove and Grove At Grand Bay. Both have contemporary designs that have further risen the standards of luxury and service in the area. Park Grove, designed by architect Rem Koolhaas with interior by well-known New Yorker designer William Sofield, will consist of three residential towers with units of 1, 2 and 3 bedrooms that offer spectacular views of Biscayne Bay. If you want to reserve your unit contact us now. And townhouses in the center and west parts of Coconut Grove (starting at $500,000). Call us at +1-305-864-3100 or follow the link above and fill out the form to get started. 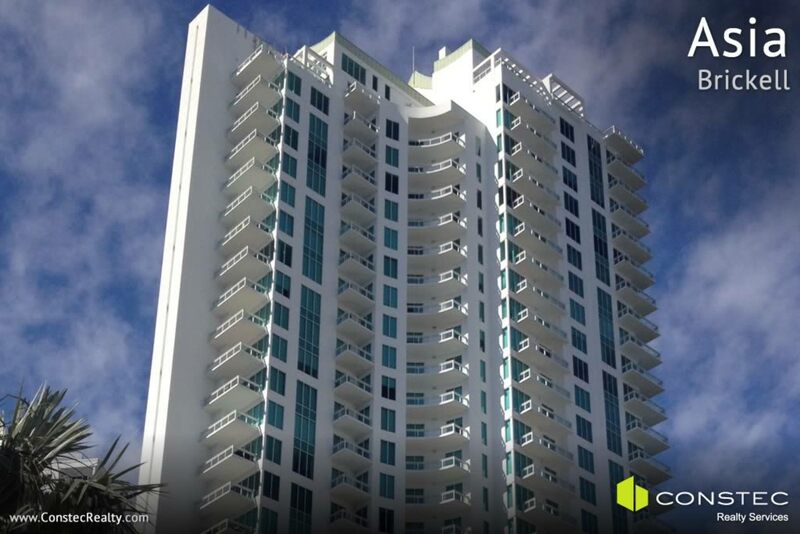 Muse Residences is a boutique ultra-luxury condo tower in Sunny Isles. The only thing that is boutique about this high-end building is the limited number of residences available. In total there are only 68 residences available in the 49 floors of Muse Residences Sunny Isles. The floor-to-ceiling glass windows and doors showcase the panoramic ocean and intracostal views. Each residence expertly integrates indoor and outdoor living spaces. Terraces are 60′ wide and as deep as 38′ and include summer kitchens and weather-resistant entertainment systems. 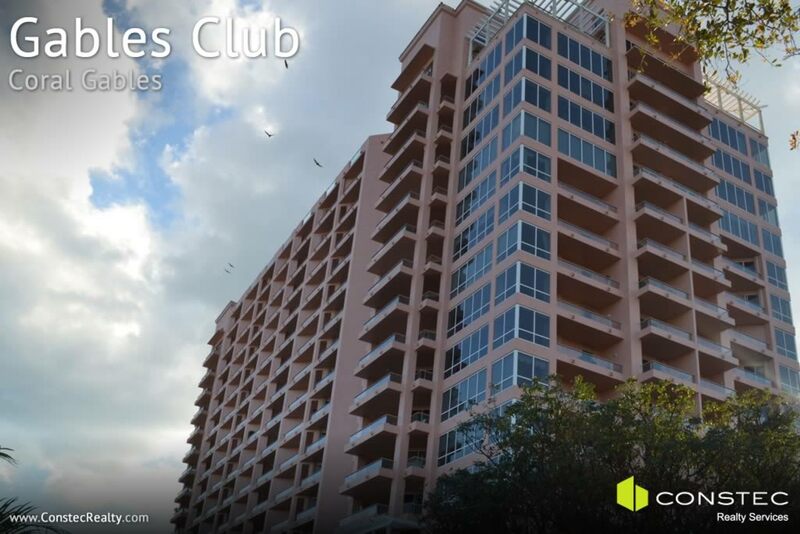 Muse Residences Sunny Isles is a smart building with smart homes. You can control everything from climate to security. Biometrics technology is integrated into elevators and your personal safe. This means that if you want, you and only you can access them via fingerprint. Another tech unique to this building is the use of Sun shades. They track the sun and adjust accordingly to save energy and provide a comfortable living space. There is also a huge 75″ television that appears from inside a mirror in the living room. Muse Residences Sunny Isles is located on 100 feet of oceanfront. The building stands 49-stories tall, the maximum allowed by FAA in this area. There are two main floor plans. One for the east side and one for the west. The floor plan on the west side changes slightly from floor to floor because the terraces are slightly different as you go up. There are two penthouses that take up entire floors. They are located on the 48th and 49th floors with the top floor plan including a rooftop terrace. 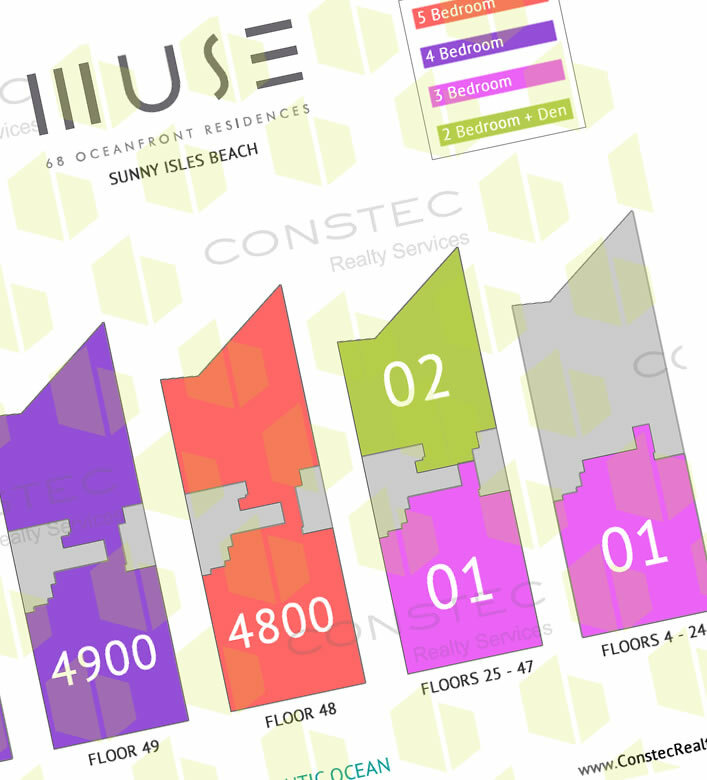 View every floor plan for Muse Residences here. The historic Miami Beach Surf Club, which has been an iconic landmark in Surfside, FL since 1929, is being fully restored to its original form. Three new 12-story glass towers will also be erected. 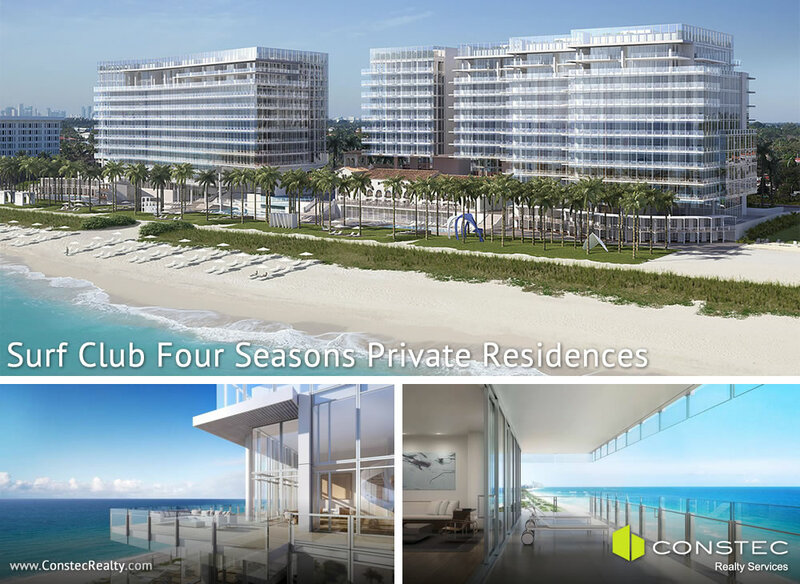 Two of the three towers, to the north and the south of the original Surf Club, will be ultra-luxurious residential buildings The Surf Club Four Seasons Private Residences. The third tower will be a luxury 77-room hotel managed by Four Seasons. The property is located on a one-of-a-kind 8.7-acre site with 815 feet of oceanfront. Also to be included in the renovation of the historic Surf Club Miami will be high-end restaurants and retail space. 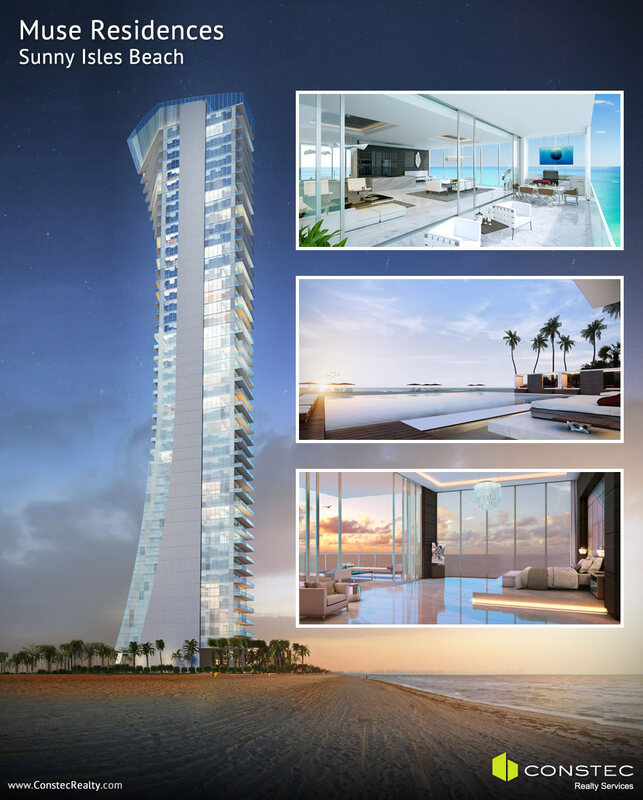 The two Surf Club Miami residential towers will only have a total of 150 luxury residences. Size of the Surf Club residences varies from 2 to 5 bedroom residences. Of the 150 residences, there are 13 ultra-extravagant penthouses. 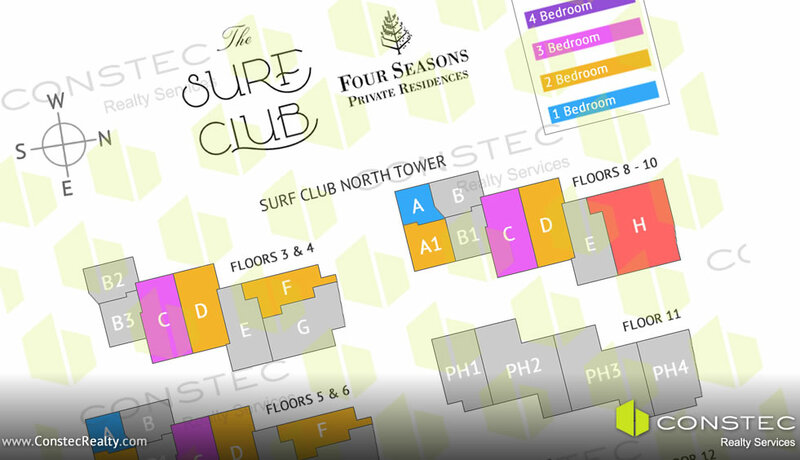 The Surf Club Miami site plan and floor plans can be viewed here. The Surf Club residences have condos that range from 1,800 to 8,000 square feet. Of the 150 residences, there are 13 ultra-extravagant penthouses. Each residential tower will have its own fitness center, spa, “residents only” pool and more. Residents will receive exclusive membership to the Surf Club. The Health and Wellness Center will have state-of-the-art equipment, private training rooms, a dedicated yoga and Pilates studio, a full-service spa with sauna, steam rooms, treatment and relaxation rooms. Surf Club residents can also take advantage of the various 24-hour staff: valet, concierge and housekeeping services. We took our time and rebuilt the entire website from the ground up. We focused on a clean design that is easily navigable and not overcrowded. You can navigate anywhere you want on our site from the top right Navbar. Get to where you are going faster without wasting time having to figure out how to get there. Interior pages incorporate a tabbed layout that lets you quickly view different sections of the page without having to endlessly scroll. 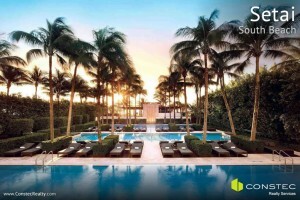 Searching for luxury Miami properties is fast and easy. We have three AJAX powered search engines. 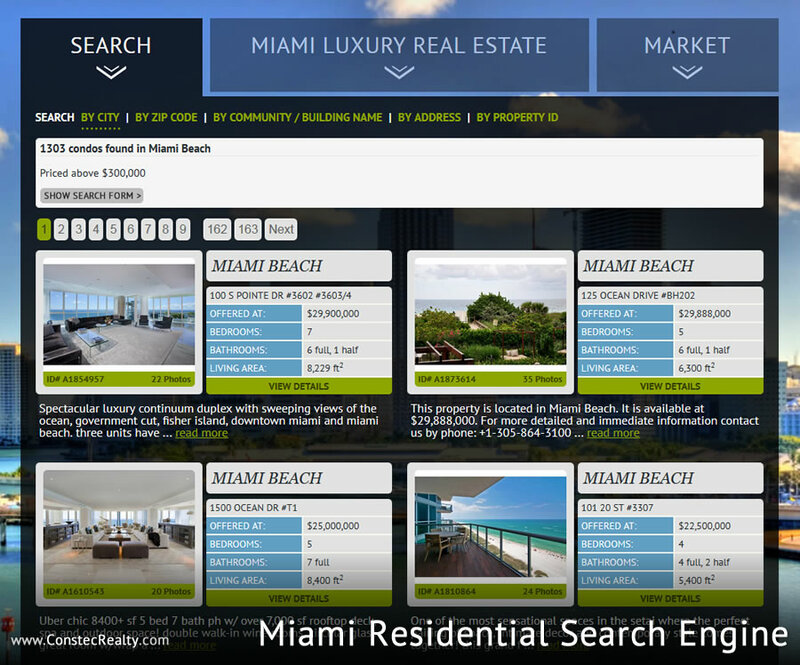 You can search for Miami residential real estate either on the homepage or on our residential property search page. We also have a Miami commercial search engine that will allow you to discover some of the latest commercial opportunities in Miami. These AJAX powered search engines load properties onto the page without having to reload the entire page. This makes for a more efficient searching experience. We have taken the time to trim the fat and improve speed, all while improving the look of the website. 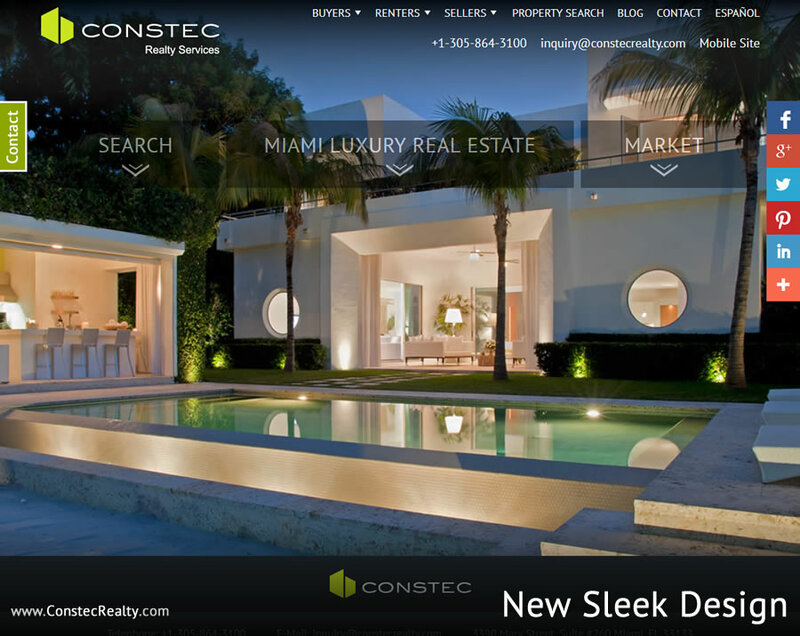 Is there something we can do to further improve our Miami Real Estate Website? Please let us know your thoughts on information we could add or what we could do to improve your user experience. Just fill out this form. Thanks! 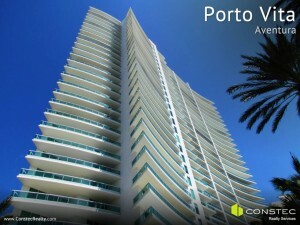 We continue with our second and last installment of the list of the absolute best luxury condos in Miami. To view part one of this series, click here. 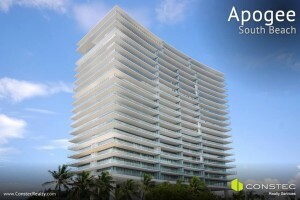 Apogee is an exclusive 22-story tower located at the tip of South Beach. It contains only 68 residences making this one of the most exclusive buildings. The views from their spacious,11-foot deep, terraces are spectacular. Residences have spacious floor plans with double slabs making the residences really sound proof. One last unique feature is the gated parking for each individual residence (you walk the parking lot and will not see a car as they are under AC behind private garage doors). Continuum is a pair of towers, North and South resting beachfront in the tip of South Beach next to entry of cruise ships to the Port of Miami. They are set on 12.9 oceanfront acres where Ocean Drive begins. Residences have floor-to-ceiling glass doors and glass-rail balconies to take advantage of the views to the Ocean, South Beach y Fisher Island. 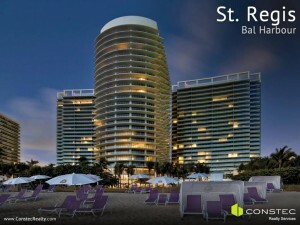 Setai is a combo ultra-luxury hotel and luxury condo tower. The residences of Setai begin on floor 17 of the 40 floors in total. You can enjoy luxury hotel amenities at home. 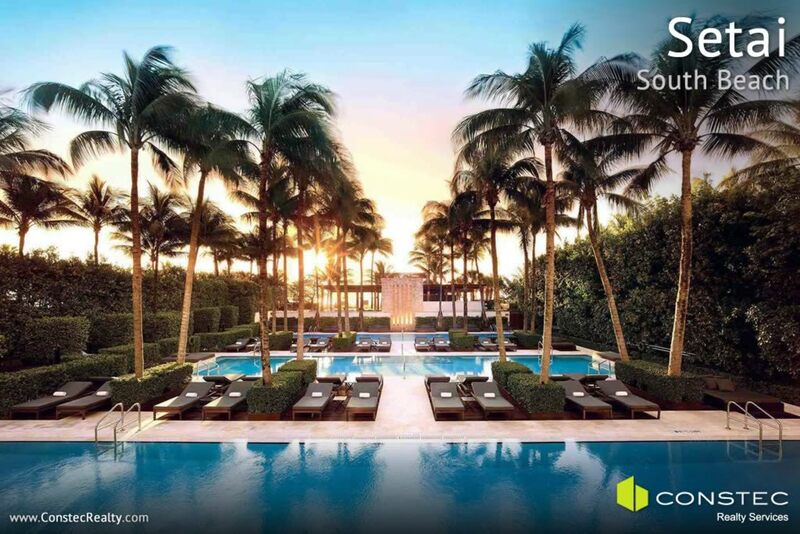 Setai has some of the most impressive panoramic views of the Miami skyline and the ocean. Asia limits residences to a maximum of five per floor, 125 in total. Asia is located on Brickell Key. Enjoy living in a zen-like atmosphere of this Asian inspired building. Ceilings are 12′ with floor-to-ceiling glass. 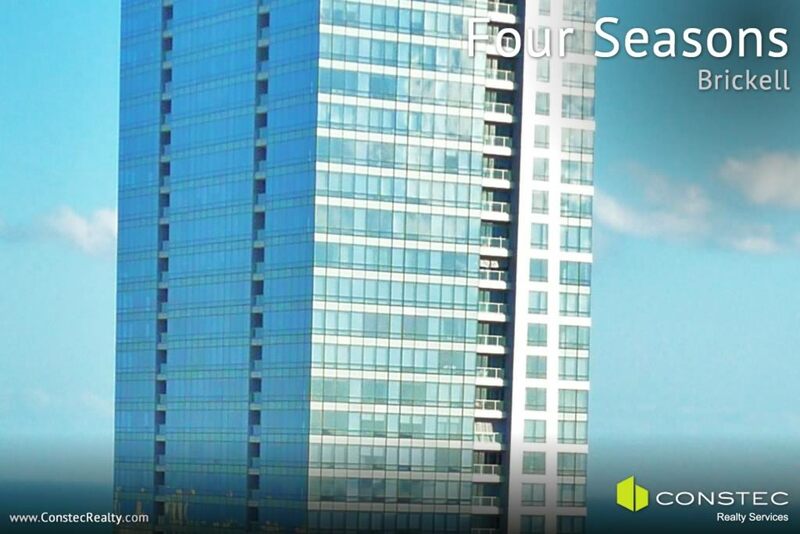 Four Seasons, Brickell is the tallest tower in Florida, built in 2003 in Brickell. It is another luxury hotel/luxury condo combination tower. The 186 luxury condos are in floors 40 – 70. Everything here is top-of-the-line, the views, the amenities and the finishes. Santa Maria is a boutique 51-floor tower with 174 luxury condo residences. It features dramatic architectural lines and lush landscaping. It also has the finest finishes and did we mention a marina? 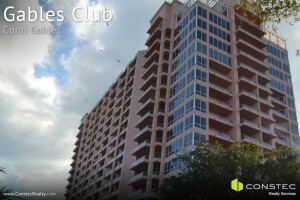 Gables Club Towers is the premier luxury condo option in Coral Gables. There are two towers with spectacular views. The buildings are situated on a 10-acre waterfront site with the waterway next to the exclusive Cocoplum neighborhood. 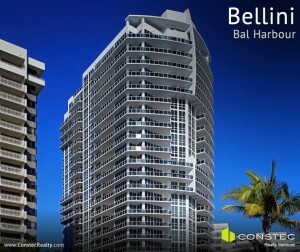 Be sure to check out Part 1 of the Best Luxury Condos in Miami as it features buildings in Sunny Isles and Bal Harbour. It occurred to me that it would be helpful, for someone that is not familiar with Miami residential buildings, to have a list of the best available luxury condos in Miami by area. This could be an excellent resource for someone who is looking for a condo in a luxury building. The goal for this post is not a comprehensive list of luxury condos in Miami buildings, since that is impossible. Rather, we shall focus on select luxury buildings in Miami. Instead of just listing the best Miami penthouses we will go through existing residential buildings that have larger condos with great views, higher quality finishes and luxurious amenities. There are promising new construction projects in the pipeline that appear to meet the above guidelines but part of what makes a luxury building maintain its status is how the existing management maintains the building. So without further ado, here is the list of existing buildings with some of the best luxury condos grouped by area. 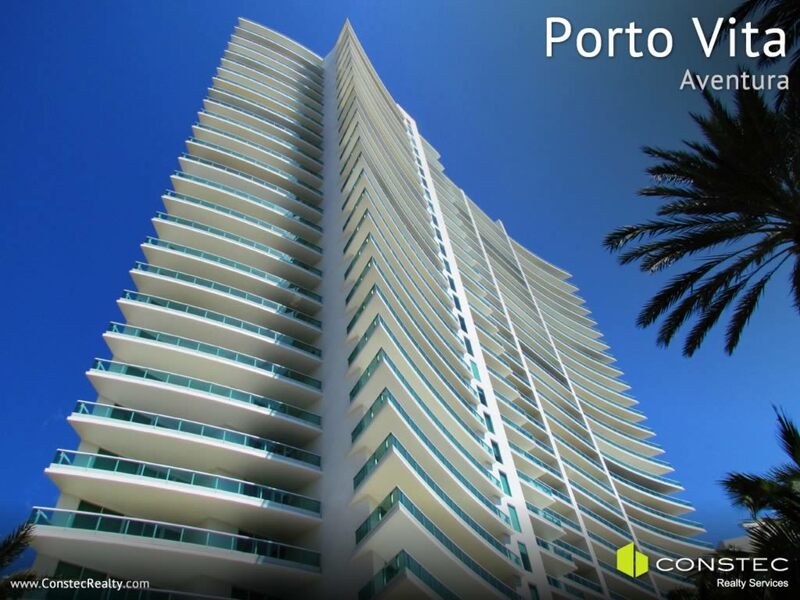 Porto Vita is a pair of towers with 400 luxury residences. Residences at Porto Vita have spacious open floor plans, private front door foyers and floor-to-ceiling sliding glass doors to take advantage of Intercoastal and ocean views. Acqualina takes advantage of some of the most luxurious oceanfront in the world. There are 188 luxury residences with flow-through floor plans and unparalleled views of the ocean and coastline. 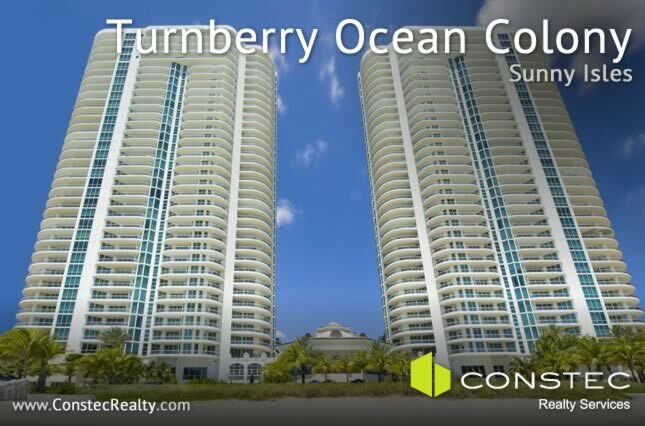 Turnberry Ocean Colony is another pair of luxury condo towers. There are 130 residences in each tower. There are only four residences per floor and even the smallest floor plans are spacious and luxurious. The expansive private terraces standout as one of the key features. Jade Beach offers 300 feet of pristine oceanfront. There are 248 luxury residences with floor plans as large as 6500 square feet. 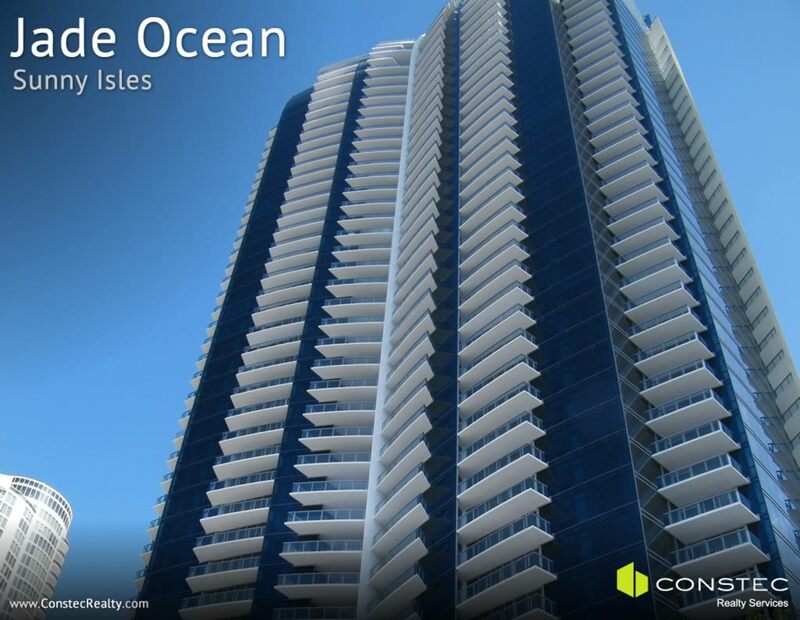 Residences have panoramic views of the ocean and top-of-the-line finishes. 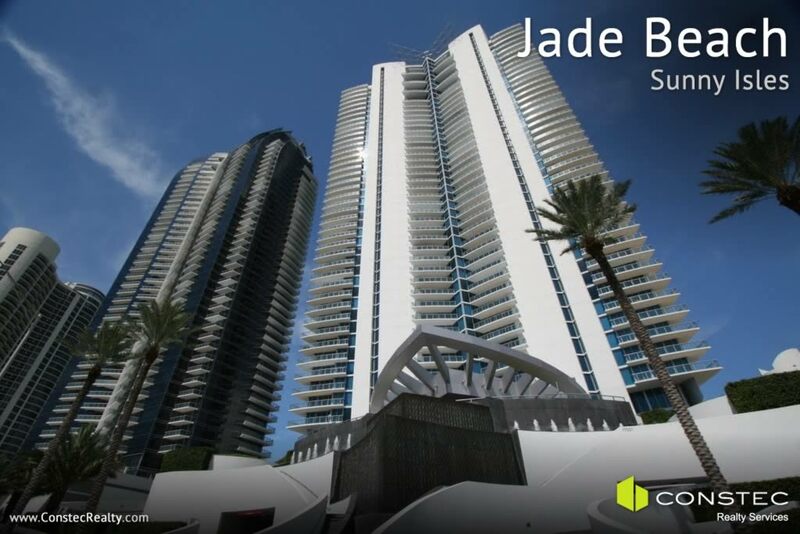 Jade Ocean is a technologically advanced building with distinctive resort elements. Luxury residences have floor-to-ceiling glass walls and open concept floor plans that come in one of three designer packages. 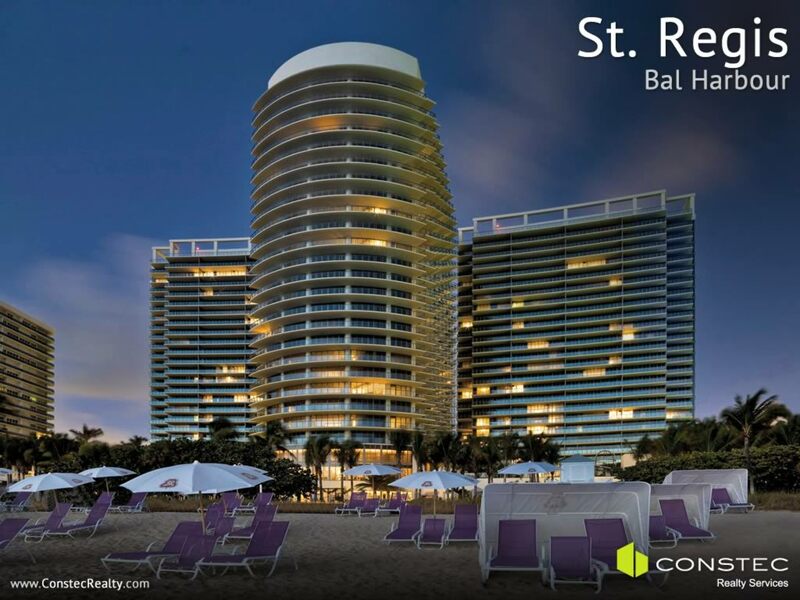 St. Regis is comprised of three all-glass towers built on 9 acres of landscaped gardens and 1000 feet of white sand beaches. Residences have flow-through floor plans with ocean and bay views. Other features include spacious balconies, fireplaces and 10′ ceilings. 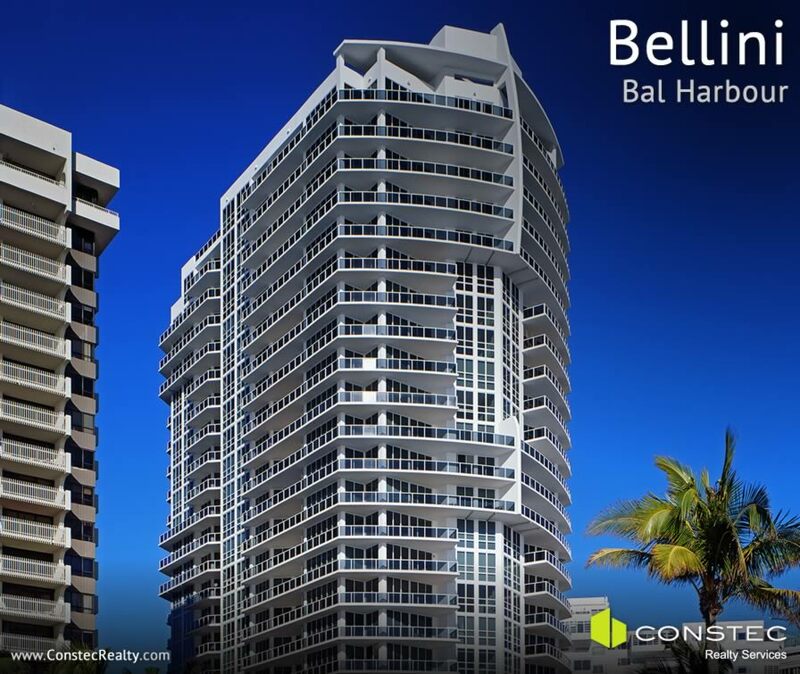 Bellini is an oceanfront tower with only 77 luxury residences. Each and every floor plan is at least 3000 square feet with spectacular ocean and bay views, gourmet kitchens and luxurious bathrooms. 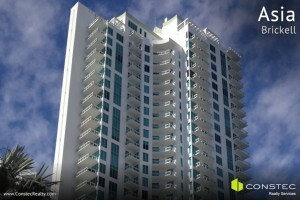 We will cover more of the best luxury condos in Miami in Part 2. We have South Beach, Brickell, Coconut Grove and Coral Gables to look forward to. Miami real estate surge equaled by its cultural boom. 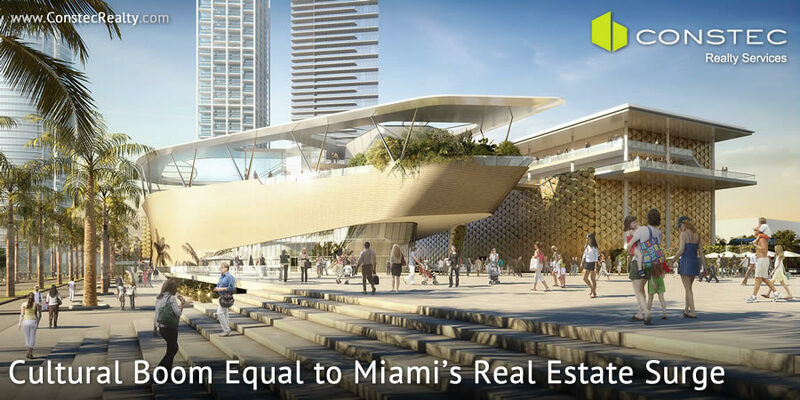 In recent years the Miami real estate market has become a focused story because of the explosive and publicized growth with new residential development projects. However, less known is the fact that simultaneously with this Miami real estate boom there has also been a cultural explosion. This cultural explosion is not only in the world of art and entertainment, but also in the culinary industry and commerce of luxury brands. Some areas in Miami, like the Design District, Brickell and Downtown Miami have transformed themselves. They offer a combination of residential and entertainment within the same district which had been unprecedented. What follows are some of the most recent additions to the world of culture in Miami that have been made in recent years. Many of them are already completed and others under construction. At the center of this cultural revolution that Miami is experiencing are two major museums: Perez Art Museum Miami (PAMM) and the Miami Science Museum. Together, these two museums have transformed the Bicentennial Park, now known as the Museum Park in downtown Miami. This spectacular museum on the shores of Biscayne Bay in Downtown Miami, opened its doors a few months ago. This museum, of modern and contemporary design, is dedicated to collecting and exhibiting international art of the 20th and 21st century. There is also a beautiful restaurant next to the bay and spectacular ballrooms for parties and/or business meetings. The Science Museum, still under construction, should be opening its doors in early 2015. This museum, costing an estimated US$165 million when finished, will function as a technology innovation center for sustainability by harnessing energy from water, sun and the wind in order to conserve resources. This magnificent cultural center in Miami Beach opened its doors in 2011. It is the only full-time orchestral academy in the United States preparing musicians for symphony orchestras. It offers a variety of concert halls for different types of presentations and a 7,000 square foot outdoor wall where free concerts are screened for the enjoyment of the public. This stunning complex in Downtown Miami is comprised of 3 buildings prepared specifically for ballet, opera and concerts. It is one of the largest cultural centers in the United States. 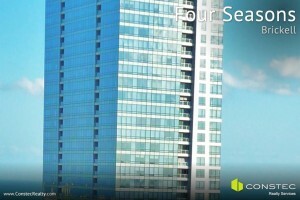 To begin your Miami real estate search in any of the areas described above search here. 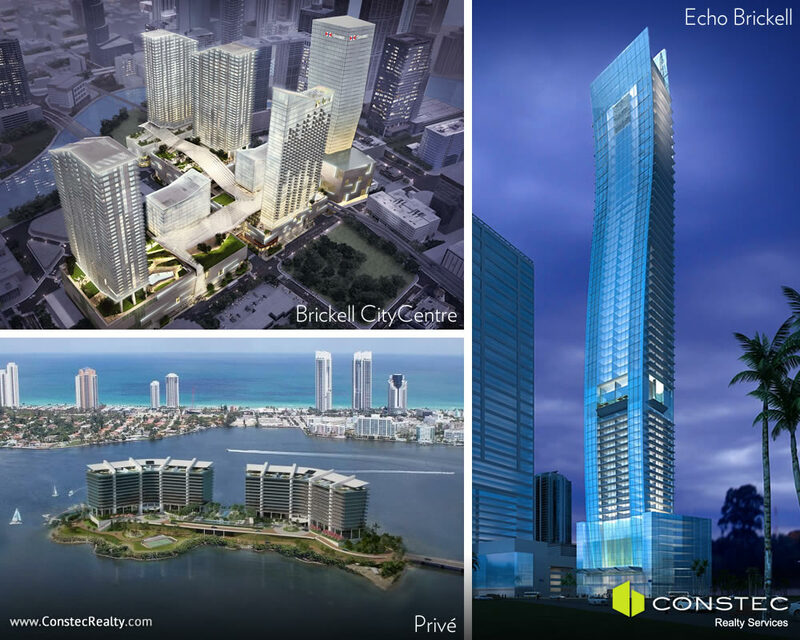 Since 2012, eleven new preconstruction projects have been announced and are selling condos in the Brickell area. Most of these preconstruction projects have already sold over 50% of their units. Four of them have sold out completely! From a total of nearly 4,000 condos that have come on the market in the past two years, 2,500 are under contract or have sold. 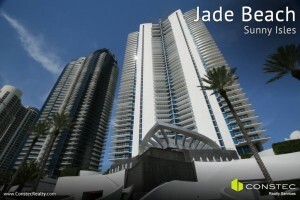 The exception is Brickell CityCentre which will start its sales very soon. Of the 2,800 condos that have been made available since January 2012, 1,400 have sold. This pattern repeats in Miami Beach, Sunny Isles and other areas along the beach where sales of preconstruction and new construction have always kept pace. 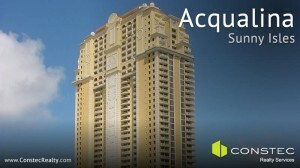 Since January of 2012, nearly 1,500 condos have been sold out of the 2,400 preconstruction condos that hit the market. 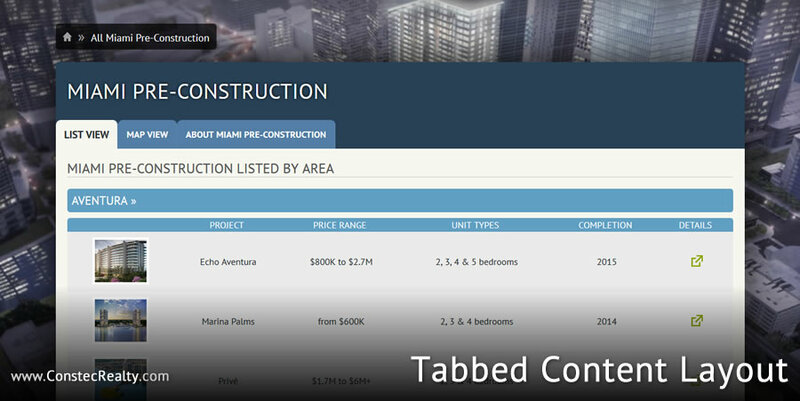 Now for condo resales, which encompasses condos that are not Miami preconstruction, the average days on the market before being sold is amazing. 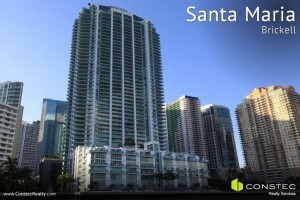 In 2011, in the Brickell area, the average number of days a condo spends on the market before being sold was 150 days. In 2013 that number dropped to 32 days. This is also happening in other areas. In the Biscayne Corridor it went from 180 days in 2011 to 30 days in 2013 . Miami Beach, Sunny Isles and the beaches went from 120 days to 39. Latin American countries like Venezuela, Argentina, Brazil, and Colombia are responsible for contributing the most to growth of the Miami real estate market over the past two years. Venezuela, pushed by its current political climate of uncertainty and instability, remains the leader in investments in South Florida. We are at a point where we seem to be catching our breath from the breakneck pace of sales of Miami preconstruction that we have had for the past three years. This is partly attributed to the fact that there are more options out there than there were three years ago. Another factor is the economic situation in the countries where most of the buyers have been coming from has deteriorated. Lastly, selling prices have strengthened over time. We are now entering into an interesting period where the skill of the Buyer Broker can play an important role. The best condominium; with the best spaces, views, floor, etc. 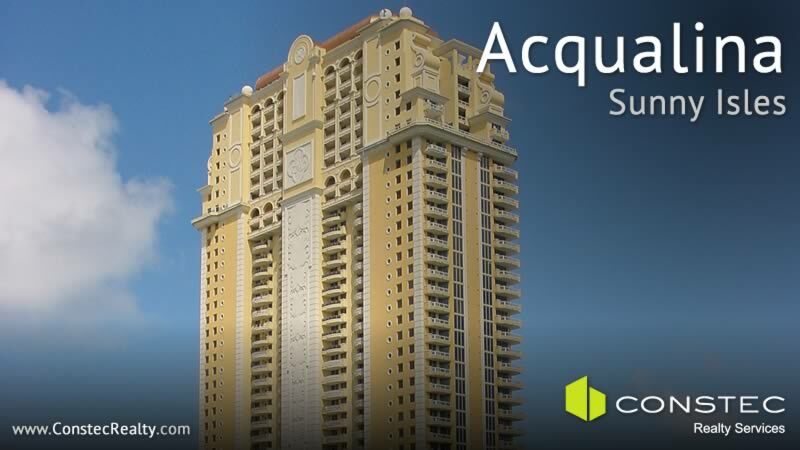 When buying a condo in Miami, each Buyer has their own set of needs and wants. What they will end up purchasing depends on taste, budget and many other considerations like place of work, schooling and so on. However, there are four things that cut across all clients and that should be considered. 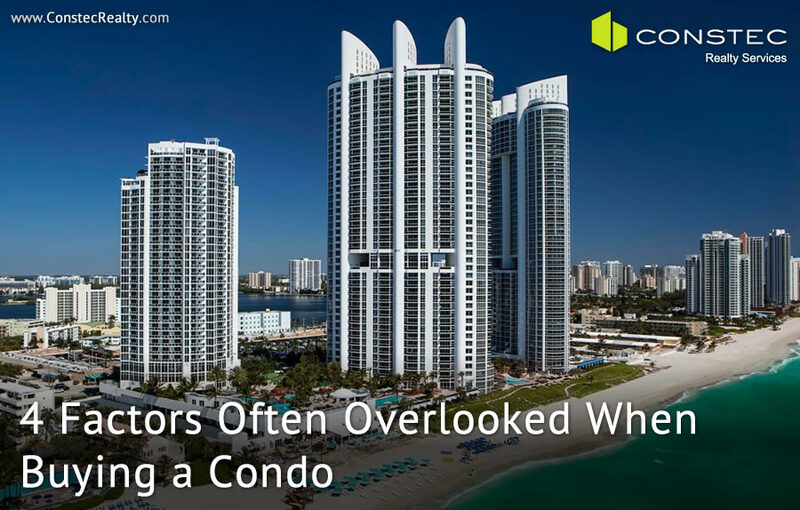 But, many times they are overlooked by the buyer and not pointed by buyer’s real estate agent, when buying a condo in Miami. These documents are massive. These are in many instances a hundred fifty plus pages. A lot of what is in there is not of particular interest but there are some portions that you need to pay attention to because they can affect whether you consider the property suitable to you or not. I always recommend taking a long “glance” at the book. Flip through every page, as there is interesting information and you will learn a lot about the condominium. The rules and regulations that govern the building. Among the most important elements in the Condo Docs are Pet Policy and Rental Restrictions. Imagine you only travel, or are moving permanently, with your two Maltese Teacup Dogs. You might think, well they are small. Well some condos only allow one pet. You are sharing with the other residents of the building the privilege of a beautiful pool, gym, maintenance crew, valet, concierge, and the list goes on. You will want to know how much in condo fees they collect and where those funds go (how big “uncollectable” is for the building). Also, buildings always needs maintenance. Every five years or so the building will be painted, equipment will need to be replaced. It is important to know whether the building collects reserves for those expenses and how large those reserves are or whether they will need to assess all condo owners for repairs. As a general rule a building with reserves is a better maintained building. This is obvious yet often overlooked when buying a condo. Find out about parking spaces, where they are. What is the guest parking situation? It’s not necessarily that you can change things but you want to know before you buy. You might want to know whether you need to drive from the street to the 10th floor of a large building to get to your spot. If you get dizzy easily in a car this might be just what you don’t need. Also, inquire about storage units. There never seems to be enough space in a condo. See how the building feels to you. Look at the people coming in, traffic in the lobby. How busy are the elevators. What’s the view of the condo at night. You want to be sure you feel comfortable. It’s a great feeling when you can say: this feels like home! 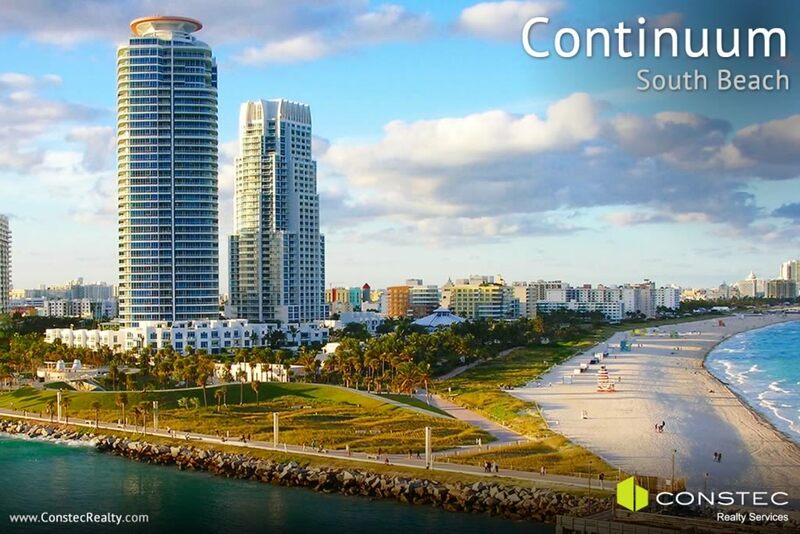 Begin your Miami condo search here. First we need to define what exactly constitutes a mansion. Well, it’s a big house, but how big is big? 8,000 square feet or more of living space can be considered a mansion. There is no hard rule, but it is recognized in the trade as a good cutoff point. Now, for an area to be considered for this list of neighborhoods with Miami mansions it was important that the neighborhood in consideration have uniformity. That is, there are several similar sized houses in the area and it is not just a one off event (meaning one mansion surrounded by other not comparable dwellings). Price was not a consideration as different areas have differing price points for similar sized properties. In general it is obvious that waterfront, larger lot size and newer Miami Mansions are more costly. 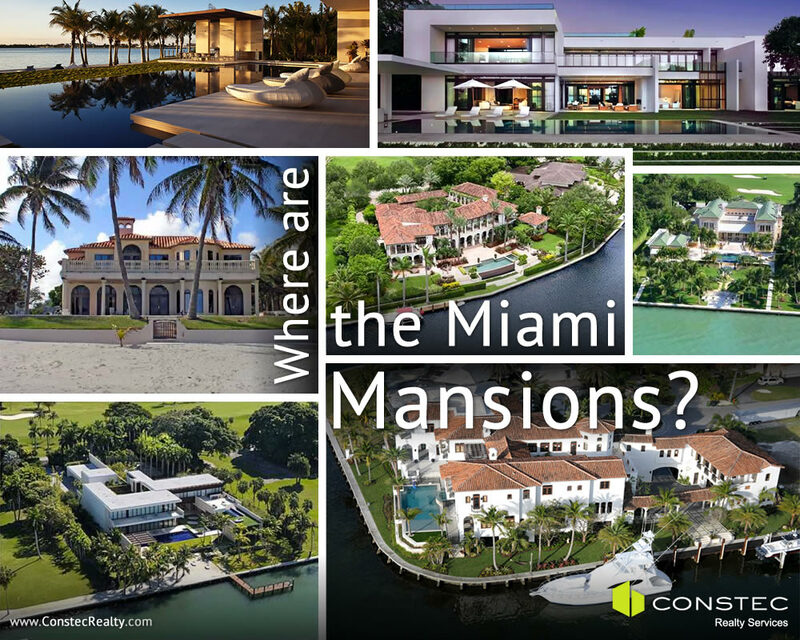 A great place to browse Miami mansions is on our ultra luxury page. Although this list is not exhaustive it gives a good feel of where those properties are to be found. Indian Creek is by far the most exclusive area with the most impressive Miami Mansions. This gated and secured community, which has its own police force, has only 40 estates on a 250 acre island. It includes a Country Club and an 18-hole golf course that takes up the entire center of the island. Properties in Indian Creek sell between $20M and $40M. Star Island has always attracted celebrities and some of the better known business tycoons from Florida and abroad. Current and former celebrity residents include Gloria Estefan, Don Johnson, Rosie O’Donnell, Shaquille O’Neal and Sean Combs. Only 32 residents can call Star Island home. A gate restricts the access to these waterfront homes with oversized lots. Boat tours departing from Miami Beach and Bayside drive by the houses and tell stories of area and owners. Properties in the area sell for $15M to $30M. In Miami-Dade if you want to own a house on the beach the only place you can do so is in Golden Beach. Only 60 families have the privilege of saying that they can walk from their house to the ocean without setting foot on pavement. Since there isn’t any street parking in the area the beach in front of these Miami mansions practically belongs to them. It is one of the areas with the least amount of beachgoers. Prices for beachfront homes go from $7M to $15M depending on size of lot and age of home. If you live in Miami and work in the traditional business centers of Brickell, Coral Gables, Miami Downtown and Doral most likely you will own a home in one of the following communities: Gables Estates, Snapper Creek, Cocoplum, Tahiti Beach or Old Cutler Bay. These are gated communities with mostly waterfront residences. Miami mansions in these neighborhoods are well-liked by year round residents because of their close proximity to great schools, places of work and the easy access to ocean for those locals that love boating. Prices range depending on community, waterfront location, size of home and lot and year built from $2M to $10M.